Humans have used sleighs for transport for over 7 000 years. 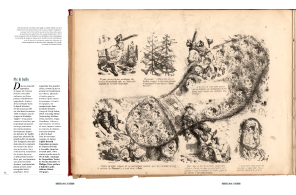 But it was only toward the end of the 1800s that sliding over ice and snow became synonymous with sports and pleasure. 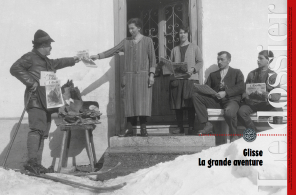 This is the story of the birth of winter sports in the Alps ! By Pierre-Louis Roy, a collector of old documents, specialised in the development of tourism. The good part about a slope is that it… goes down. But you still must master the device that you are riding. Toboggans and sleighs were used very early on to transport goods and people, to the point that they became an essential means of transport for mountain farming, both in the winter and summer. The pleasures of the first ski resorts would still be a long time coming. By Jean-Loup Fontana, curator at the Roudoule environmental museum in the Gavot region to the north of Nice. The collections at the Musée Dauphinois (Grenoble) include a number of objects such as this bob-sleigh made of wood, fabric and metal. They are presented in the “History of skiing” exhibition which, in spite of its name, also deals extensively with the other winter sports in the Alps. By Chantal Spillemaecker, head curator of the Musée dauphinois. 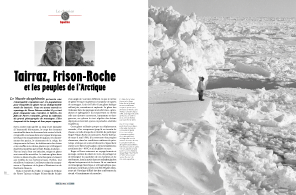 The Musée Dauphinois presents a remarkable exhibition on the northern populations for whom travel sliding over ice and snow is indispensable to their survival. We noted this report by Pierre Tairraz, produced exactly 50 years ago. 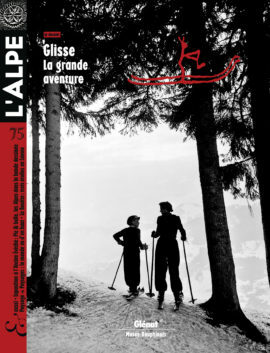 Caroline and Valérie, the daughters Pierre and Danièle, manage the collection of the great mountain photographer. They discuss here the photos taken by their widely travelled father. Being and skiing, an emancipation ? I ski, therefore I am. Surprising as it may be, a philosopher took particular interest in skiing and his name was Jean-Paul Sartre. In his major opus, Being and Nothingness, he analysed skiing in detail and found it to be a way to experience freedom. Or simply a way to truly be free. An explanation by Alain Ghersen, a philosopher mountaineer. A ski instructor and trainer from Chamonix, a former journalist who now produces documentaries and writes books on skiing and the mountains, Gilles Chappaz has fun here defining, in 26 letters, the sensations of flying down a mountain and the thrill of speed. A perfectly subjective approach that is both self-derisive and fervent. Jours Blancs is a project on colour. The postulate for the series would appear simple, i.e. use the white of a snowy mountain and the fog of days without sun as a background for painting colours. Touches of blue, yellow and red (drawn from the ordinary world of skiing) that bring life to the smooth and immense surface of the Swiss summits. By Pauline Martin, exhibition director at the Élysée Museum in Lausanne. New winter sports appeared in France in the 1970s in the wake of the U.S. counter culture. Snowboarding took over mountains to the point of transforming them into snow parks. Lying outside the traditional activities, these new sports were looking for freedom and fun. Communities were created with their codes, styles and values. Let the show begin… By Véronique Reynier, assistant professor of social psychology at the University of Grenoble Alps. Zembla figured prominently during the infancy of the woman who became head curator of cultural heritage and imagined an exhibition on mountains in comic books. 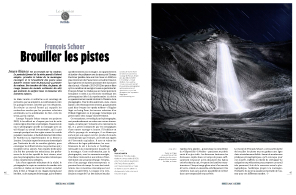 Isabelle Lazier presents here her first wanderings through those pages and the images of mountains that eventually turned into the Pic & Bulle exhibition that is now on show at the Ancien Évêché Museum in Grenoble. An intimate flash back. Paysage->Paysages. The Isère department will serve as a laboratory for a major cultural programme bringing together the works of over 25 artists. What should be the viewpoint from which to describe reality ? The question applies to one and all, writers, painters, movie directors, scientists. Views from high points immediately impress due to their panoramic nature that would seem to present the world as it is. But can truth be obtained simply by gaining height ? What if views from high points are simply mental constructs ? By Guillaume Monsaingeon, founder of the “Ouvroir de cartographie potentielle” and exhibition director. La Bouitte lies at the entry to the Vanoise national park, in the Belleville valley. In December, this exceptional restaurant will celebrate its 40th birthday. René and Maxime Meilleur are the only father and son duo that have risen up together from the first to the third Michelin star. 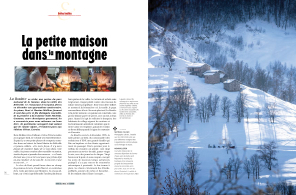 Goutatou, our culinary reporter, met them in preparing an excellent book on the cultural heritage of the Savoy and on Alpine cuisine, recently published by Glénat. Excerpts.